I have been collecting pictures of curving staircases for a while now - they seem such a balletic architectural expression of movement. Here are some of my favourites. This one here - under a fly-over in Zurich is perhaps in the most unexpected context of all. 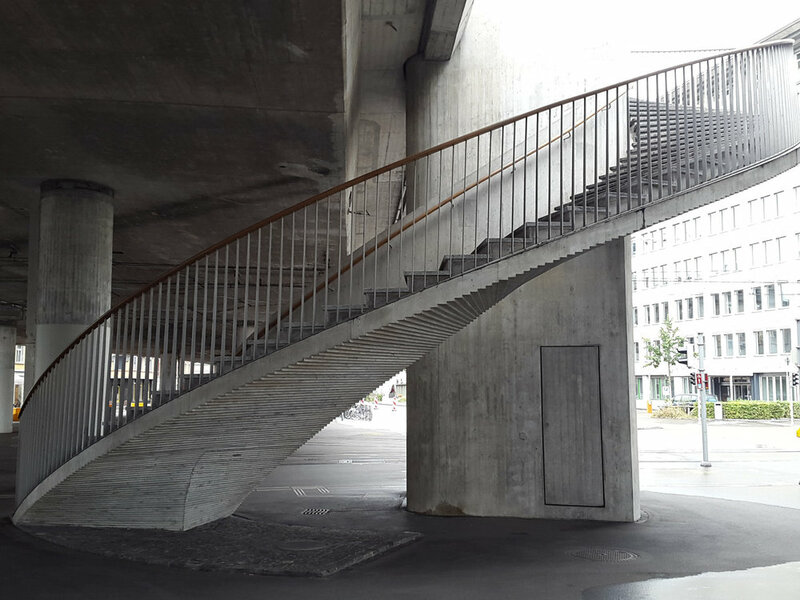 The pair of concrete staircases snake around the great shuttered columns in a beautiful sweep. I love the central spine along the underside and the ribbed micro-steps. And the use of timber for the hand-rail adds a lovely touch of warmth. 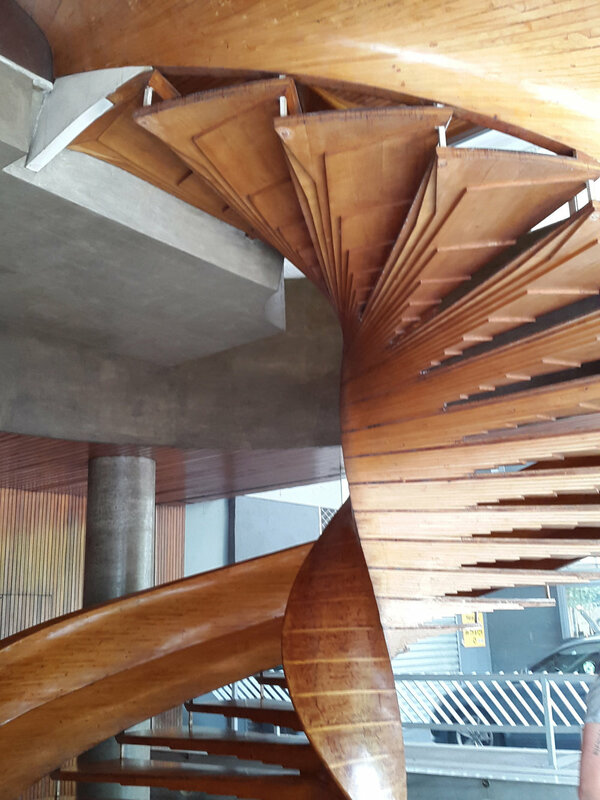 Below is a beautiful wooden staircase which dominates the lobby of a mid-century office building in Marseilles. Each step is made up of a series of laminated wooden layers built up to the full depth of the riser in the centre of the staircase and tapering to a single layer on the outside edge of the step. The central core has an undulating almost ribbon-like quality and the steps have something of the feel of an old wooden propeller viewed in a stop-frame animation. This below is the Eighteenth Century 'Nelson's staircase' in Somerset House. Built with stone steps with no visible buttressing or support it seems to float off the curve of the wall. And this is the staircase in the old vegetable market in Porto. It must have been very grand in its hay-day and has a faded charm now. I like the glazed brick stairwell - looking swimming-pool green here in the flurouscent light. 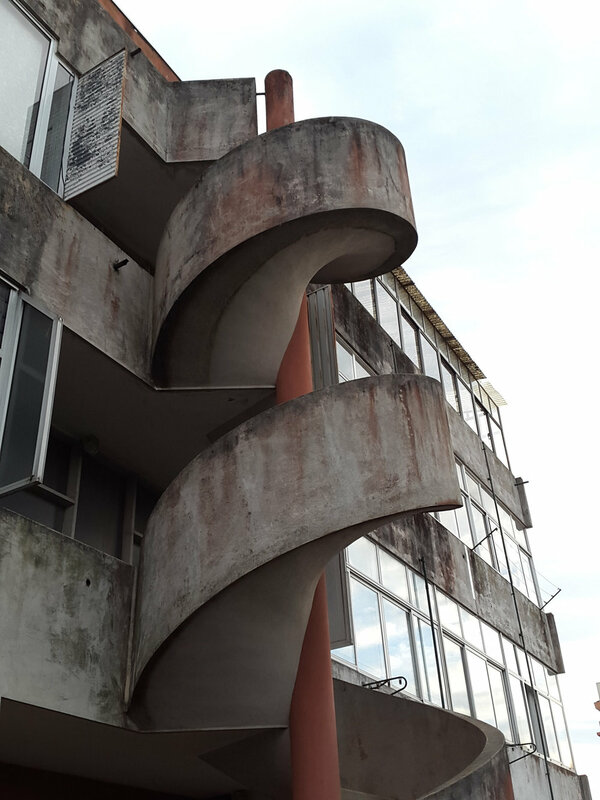 And finally perhaps my favourite - this beautiful concrete fire escape on the back of a very unassuming apartment block in the Porto suburbs. Poetry in motion.